We have a treasure trove of historical records that detail crimes and criminals in Little River County. Our records show what life was like in the early to mid-1900s. Named after the river that borders its northern and eastern sides, Little River County was created from parts of Sevier and Hempstead counties in 1867. Agriculture, timber, cement and paper manufacturing were the primary industries. Our collections contain two criminal dockets by the Justice of the Peace of Little River County. These dockets give details about crimes, including petit larceny, assault and battery, disturbing the peace, embezzlement and murder. The records also showcase laws, including those against lottery ticket sales. In December 1919, 24 people were charged with “gaming” or “selling lottery tickets.” Inside one docket book, researchers found an affidavit for warrant from Constable D.W. Bailey, who sought the arrest of R.L. Elliott. Elliott had sold lottery tickets for an automobile, records show. 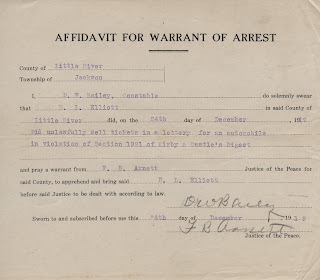 Justice of the Peace F. B. Arnett signed Elliott’s warrant and made the following record in his docket: “On this the 27 day of Dec  comes the defendant R.L. Elliott and being fully advised as to the law entered a plea of guilty to the charge whereupon the court fixes his punishment at a fine of fifty dollars $50 and all the costs.” Today, a $50 fine would amount to more than $700. The record is just one example of the kinds of documents the State Archives and its branches preserve. Much of the information is interconnected. For example, the archives headquarters in Little Rock has a copy of “A digest of the statutes of Arkansas: embracing all laws of a general nature in force at the close of the general and special sessions of General assembly, 1919,” by William Fosgate Kirby and John Thomas Castle. The digest is mentioned in Elliott’s arrest warrant. 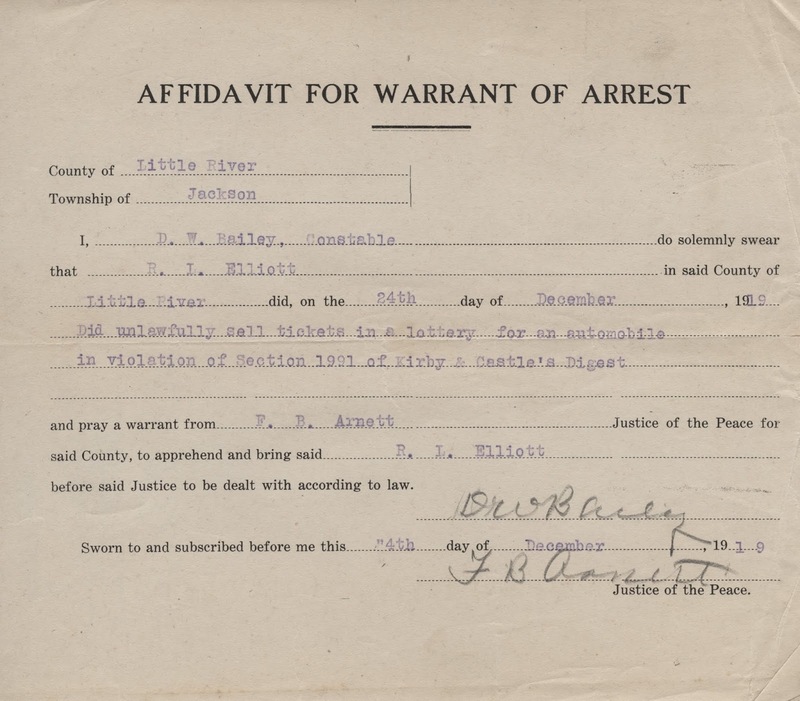 These resources, including criminal dockets, help genealogy researchers fill in the gaps in their family histories and give researchers insight into how Arkansans lived 100 or more years ago. Our State Archives are built on donations of historic value. At SARA, we accept donations of original materials pertaining to the history of southwest Arkansas. For more information contact Melissa Nesbitt, archival manager, at 870-983-2633 or email southwest.archives@arkansas.gov.